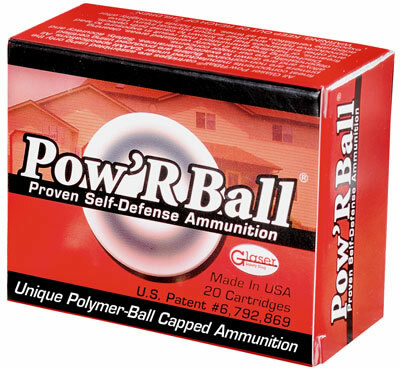 The Pow'RBall(TM) is a controlled expansion bullet capped with a polymer ball giving it a "full metal jacket" or rounded ball is smooth and slick. It will not hang up or snag as it guides the cartridge effortlessly into the chamber. The jackted bullet's lead core is shaped into a specially designed cavity that promotes deep penetration and high weight retention. All of this aids in energy transfer that produces stopping power. Pow'RBall will not get plugged by heavy clothing. This ammunition will give you confidence and peace of mind knowing you can count on it in a critical situation.